The Martins custom audio cabinet built from maple, birdseye maple, thumbnail maple, ebony pulls and topped off with a natural edge English walnut slab. Custom audio cabinets, media storage, and stereo cabinets made to order. Our custom audio cabinets are unique and unusual to catch the eye. We have many beautiful kinds of wood in stock to build your custom audio cabinet from. Custom entertainment centers, big screen tv cabinets, plasma tv cabinets, audio cabinets, media storage and stereo cabinets made to order. Beautiful custom cabinets made to house your big screen tv, plasma tv, along with specialty audio and video cabinets. Display/Media Storage cabinet. This cabinet was designed to fit in a small space. It holds an extensive CD, DVD, and VHS collection. 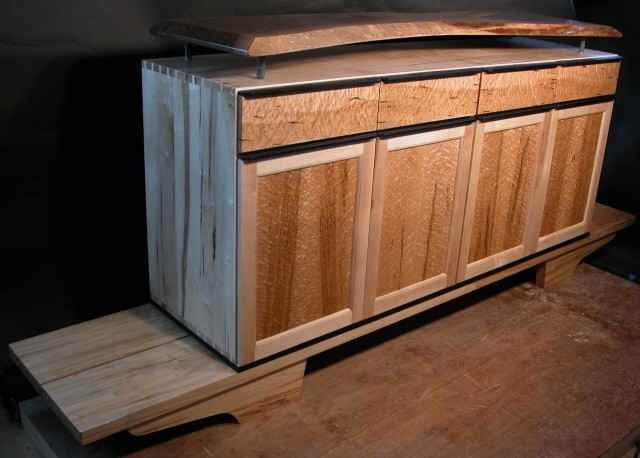 Custom entertainment centers, audio cabinets, media storage and stereo cabinets made from unique and unusual woods. A custom audio cabinet in Oak and Curly Maple. This audio cabinet is also available in darker woods such as Cherry or Walnut. Custom audio cabinets, entertainment centers, media storage and stereo cabinets made to order by Dumonds Custom Furniture.